Meeting: Hospital Medicine 2017, May 1-4, 2017; Las Vegas, Nev.
Background: Although code status discussion does not routinely happen at hospitals in Japan, many people reportedly start to think of their end of life issue and would like to express it, according to questionnaire survey conducted by the Ministry of Health, Labour and Welfare. There has been no report which focuses on prevalence of do-not-resuscitate (DNR) orders and what factors have influence on the DNR orders on admission in Japan. Methods: We conducted cross-sectional survey by chart review. All patients, who admitted to general ward of internal medicine in our hospital from July 1st to October 31th in 2016, were included. Patients’ characteristics, including age, gender, primary diagnosis on admission, the place of living (home or long term care facility), ability of activities of daily livings (ADLs) and instrumental ADLS (IADLs), and DNR status on admission were collected. In our hospital, physicians are supposed to put information of patients’ decision making capacity and history of code status discussion as well as whether they are in the advanced stage of various illness in the admission note. We obtained those data by chart review. We investigated the factors associated with DNR status by logistic regression analysis. Results: 1358 patients were included. 73 were excluded due to lack of data and 1285 were analyzable (94.6%). The median (interquartile) of age was 72 (56-88)　and 763 (56.2%) were male. DNR was ordered for 112 (8.3%) patients. Patients’ characteristics were shown in table 1. Of note, 303 (22.3%) do not have complete decision-making capacity (DMC). 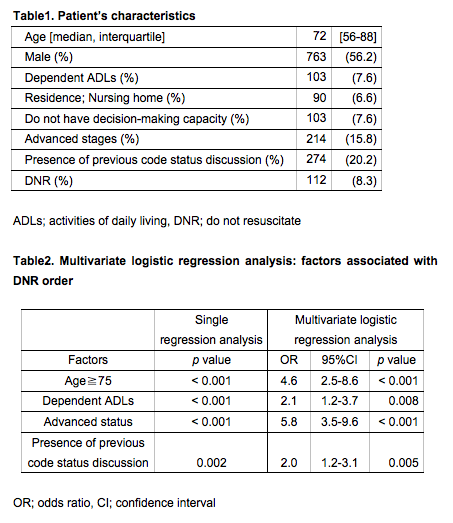 The age of 75 years and older, presence of previous code status discussion, being in advanced stage of illness, declined functional status of ADL were associated with DNR orders on admission by multivariate logistic regression analysis (table 2). In group of patients with advanced stage of illness (n=214), 146 (68.2%) do not have complete DMC, 91(42.5%) have no previous code status discussion, and surrogate decide coded status without patient’s opinion in 97(45.3%) because of lacking in decision making capacity. Conclusions: Old age, dependent ADLs and advanced stage of illness increased DNR orders. Furthermore, presence of previous code status discussion increased the DNR orders. It might possibly because people start to think of end of life issue after the first code status discussion and change it into DNR even if they may choose full code status at the first discussion. Given that significant number of patients in the advanced stage of illness do not have the complete DMC, we need to start discuss end of issue including code status preferences before losing DMC. Yoshino, K;	Hiraoka, E	. FACTORS ASSOCIATED WITH DNR ORDERS ON ADMISSION IN JAPAN. Abstract published at Hospital Medicine 2017, May 1-4, 2017; Las Vegas, Nev. Abstract 51. Journal of Hospital Medicine. 2017; 12 (suppl 2). https://www.shmabstracts.com/abstract/factors-associated-with-dnr-orders-on-admission-in-japan/. Accessed April 22, 2019. « Back to Hospital Medicine 2017, May 1-4, 2017; Las Vegas, Nev.